Are you interested in a career at Whole Foods Market? Whole Foods Market is a natural and organic retail food company with a mission to promote the health, well being, and healing of people and our planet. 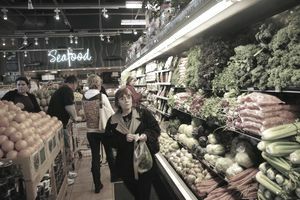 There are over 490 Whole Foods Markets throughout North America and the United Kingdom. Fortune Magazine has recognized Whole Foods Market as one of the "100 Best Companies to Work For" in America for the past 15 years. They also are committed to their team members, with 100% of Store Team Leader positions being filled from within in 2014. Information on Whole Foods Market employment, including job openings and benefits, can be found online. Job seekers can search for and apply for Whole Foods store and/or office jobs by location and position online. The process is outlined on the website, and walks you through the steps of creating a profile, uploading your resume and completing an application. You can apply for jobs, save your profile, update your information at any time, and set up job alerts for when a position that interests you becomes available. You can also search for jobs at computer kiosks located in Whole Foods Market stores. Careers can be found in their stores, bakehouses, commissary kitchens, distribution warehouses, regional offices, and global headquarters. Whole Foods employees are now also Amazonians, thanks to Amazon’s 2017 purchase of the food chain. The partnership now allows Amazon Prime members to shop online at Whole Foods Market and have groceries delivered to their door. Amazon is also looking to expand Whole Foods into states like Idaho, south­ern Utah and Wyoming, along with many other suburban areas. To accommodate more online customers, the chains will likely be warehouse-grocery store hybrids - a move that will add many new jobs. Whole Foods makes it seamless for existing Amazon employees to transition to Whole Foods, and vice versa. Any interested employee should first talk with their local HR rep to get the ball rolling. Whole Foods Market offers many benefits to its employees starting with competitive compensation, career growth and retention, employee discount, paid time off, wage transparency, gains sharing, and stock options. This is in addition to medical, dental and vision plans, life insurance, retirement savings, team member emergency funds, and a health savings account. They also offer incentives for team members to improve their health, through immersion programs presented by experts in the fields of nutrition and preventative medicine, and featuring topics such as nutrition and health, exercise, and cooking. Benefits packages are available to employees who work more than 20 hours per week and have completed a probationary period of employment. There are some variations in benefits between stores in the U.S., Canada, and the U.K. If working at a company committed to environmentally sound practices in all aspects of their store, facility, and office operations are important to you, Whole Foods Market may have the perfect job for you. Their core beliefs and values guide their business in many ways, providing services to the communities they serve as well as their team members. Their diverse programs include combating poverty and promoting self-sufficiency in third world countries whose products are sold in their stores, promoting healthy eating education in communities to improve health and wellness in the U.S., and an emergency fund established to assist team members affected by disasters such as hurricanes, tornadoes, and wildfires. Whole Foods Market supports local growers and vendors by marketing their products, as well as providing low-interest loans to independent farmers and food artisans to help them expand their businesses, helping to promote jobs and diversity of land use in the community.